Bill Shankly said of him: “He belongs in the company of the supremely great, like Beethoven, Shakespeare, and Rembrandt.” He then dubbed Dixie Dean the greatest centre-forward there ever will be. He is the epitome of a footballing legend. 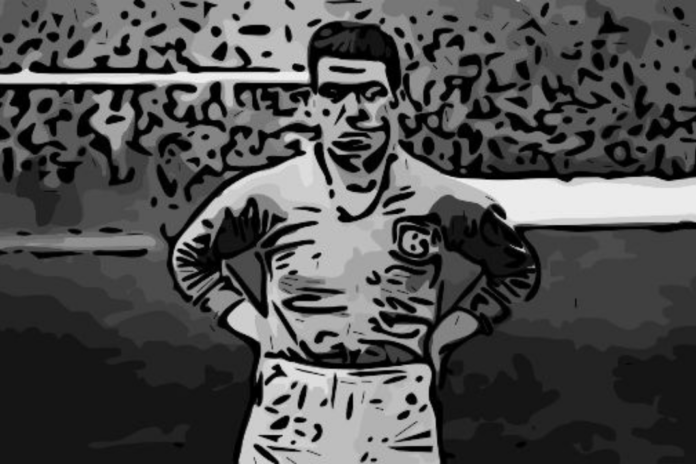 Birkenhead-born and bred he signed for Everton in 1925 for a record-breaking fee. He made the number nine jersey eponymous with prolific goal scoring. What enhances his status is the fact he stayed with Everton as they bounce from first to the second division and back again. His loyalty and tenacity are boundless. With 473 goals in 502 appearances for club and country, he is also a statisticians delight. With 383 of those goals coming for Everton, he has earned every accolade and title bestowed upon him. In his first season, he scored 32 league goals, just six goals shy of the league record. It seemed unlikely that he would ever kick a ball again as he was involved in a near-fatal motorcycle accident in the summer of 1926. It was reported that he hovered between life and death and had extensive skull and jaw surgeries resulting in the legend that he had a steel plate left in his head. Many of his goals were indeed headers. At the end of the 1926-27 season, Everton just avoided relegation. The young, freshly recuperated Dean was about to embark on a season that is mindblowing, to say the least. This record of 60 goals in a season has never been beaten. The first came in the opening match of the season, which was a 4-0 win over Sheffield Wednesday. The assist came from Irvine. Dean scored in the second match of the season. This may have been Everton’s season but George Camsell made his mark in the 4-2 defeat by scoring all of Middlesborough’s goals. Camsell had scored a record-breaking 59 goals the previous season and it looked as if that record was there to stay. He scored all five goals against Manchester United, the first time he had done so in a match. Those goals were surefooted and well placed and he continued to enthral the crowd. Strangely, he did not appear in the derby and he was away on International duty when Everton beat West Ham 7-1. On his return, he scored two successive hat-tricks, the first against Portsmouth and the second Leicester. After the victory against Portsmouth, Everton were on top for the first time that season. Being strong and consistent is the only way to set a record and Dean certainly was. In the penultimate match of the season, he netted four against Burnley. According to the Echo, this matched sealed the First Division title but Dean needed a hat-trick against Arsenal to break that record. It was a draw and the goals came with the classic hallmarks of this phenomenal player. The first was from a corner. It was taken by Critchley who had provided Dean with so many of his goals that season. The second was a well-struck penalty. Dean earned it and owned it. The final goal was a header. That metal plate had seen some action. 60 league goals in a single season. That’s a record that has stood for 90 years and doesn’t seem able to be broken. He was only 21-years-old when the season ended. Where do you go from here? Everton didn’t keep the title and in a bizarre turn of events, they were relegated for a single season. 1930/31 saw Dixie Dean captain his squad to promotion back the First Division and a second title in 1932. They also won the FA Cup in 1933. Dixie became the first number nine. The numbering of jerseys was introduced to help those listening on the radio. Whereas some players are just remembered for their on-pitch brilliance, Dean should be remembered for his heroics off the pitch. After winning the FA Cup, Everton went on a six-match tour of Germany. They won two, lost one and drew three matches. It was a tough tour for the 17-man squad. Six matches in 15 days is a challenge. This tour had more serious challenges. By now it was clear that Germany was being ruled by a totalitarian regime that had many evil agendas. On arrival, Everton were given orders to give a Nazi salute before kickoff. Dean and his teammates simply refused to follow orders. The following match was watched by Joachim von Ribbentrop and Hermann Göring, two of the most feared men in the land and yet they never gave in. He didn’t fall for Nazi trickery and when they were given the wrong sized ball to train with Dean demanded they were given the right size. Whatever the pressure, Dean and his men stood strong. They defied the Nazis. When they returned to Merseyside they were given a hero’s welcome. Everton fans should be very proud of this team for standing up to the bullies and making a strong political stance. He stopped playing for Everton in 1937 and eventually stopped playing football in 1940. He ran a pub in Chester called the Dublin Packet and lived a quiet life. After many years and many injuries, he lived an unassuming life with his family. His health was poor and he had to have his leg amputated. His friendship with Bill Shankly is iconic. It sums up everything that’s good about the beautiful game. There was huge mutual respect. They put aside their allegiances and decided to have lunch prior to the Derby on March 1 1980. Dixie Dean passed away at Goodison Park later that day at the ground that he immortalised. It is very difficult to write a conclusion about a player so great. There is a long-overdue biopic in production as I write this report. Dixie Dean was a hero, a truly British icon, understated, yet outstanding. Modest and proud at the same time. Everton, you did well to sign him. Dixie, you proved your worth every time you played.